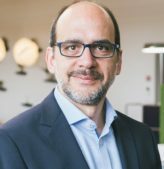 Nasri Nahas brings to Biopôle over 20 years of experience in the life sciences sector through roles in applied research, business development and general management. In Switzerland he was CEO of Geneva Bioinformatics and Spinomix, while in France he worked as a research engineer at Genset and Valigen. Nasri has a significant track record in defining and implementing strategy, leading dynamic teams of experts, and building long-term relationships with industry and academic partners. He holds a Masters of Engineering in bio-industry and enzymatic engineering from the University of Technology of Compiègne, as well as an MBA from the University of Geneva and a diploma in Health Management from the University of Lausanne. Since 2019, Nasri Nahas is member of the Foundation Council of the CHUV Foundation.